Western blot analysis of extracts from K562 cells, using CLIC3 Antibody. The lane on the right is treated with the synthesized peptide. Immunogen The antiserum was produced against synthesized peptide derived from human CLIC3. 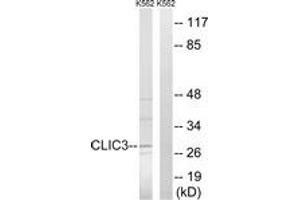 CLIC3 Antibody detects endogenous levels of total CLIC3 protein. 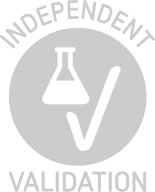 Background publications Humphray, Oliver, Hunt, Plumb, Loveland, Howe, Andrews, Searle, Hunt, Scott, Jones, Ainscough, Almeida, Ambrose, Ashwell, Babbage, Babbage, Bagguley, Bailey, Banerjee, Barker, Barlow, Bates, Beasley et al. : "DNA sequence and analysis of human chromosome 9. ..." in: Nature, Vol. 429, Issue 6990, pp. 369-74, 2004 (PubMed).